With the IoT booming nowadays, the number of connected devices grows exponentially and so does the related software that drives them. There is no doubt that Firmware Over The Air (FOTA) is a highly desirable – if not required – feature for any embedded project/product both DIY or commercial. Being able to provide a remote firmware update is obviously very beneficial. The opportunity here is to enhance product functionality, operational features and provide fixes for particular issues. Updating the firmware OTA may eliminate the need to bring a product into a service center for a repair. Although not every issue can be resolved with a firmware update, if one is available for a particular issue, it can save a lot of time and money. I already have a large number of connected devices running at home and in case I need to do a firmware update, it is a nightmare. I have to disconnect the respective device from whatever project setup they are attached to re-program and then re-install. Not all embedded systems have the possibility to allow FOTA due to the complexity and required connectivity, for example none of my RFM12B/RFM69CW related projects have that feature. While possible by installing additional SPI flash (see as example Moteino wireless upgrade), it isn’t a real self-updating node and still requires quite a lot of skill to achieve, and only within the range of the transceivers (not over the Internet). This solution limits the available user code to 236KB (256KB-4KB-16KB); For ESP-HTTPD based projects this would be just about the unmodified basic application. Obviously if you need to squeeze in more functionality, you’d need a larger SPI flash than 512KB. 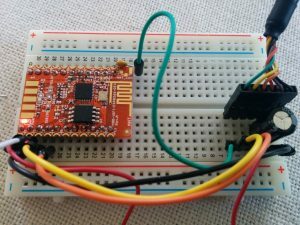 There are few off-the shelf ESP8266 breakout boards with > 512KB flash size; alternatively you could desolder and replace the SPI flash with a larger one. I can identify two separate firmware update modes – externally pushed firmware file and another one that is initiated by the remote device on periodical or manual start basis. Externally pushed firmware update would be when the device receives the firmware file over a HTTP POST request and flashes it, whereas in the self-initiated firmware update mode the device would periodically check central firmware repository for firmware update, pull the firmware and reflash itself. The later can be initiated on schedule, or manually by user (just like your computer checks for updates vs how you can manually force-check). The first method is more convenient for development mode, where the device is connected to the local network. I find it quite useful to focus on developing the code without having to manually place the node in firmware update mode, connect FTDI programmer, bring it out of firmware update mode etc. Also the speed when flashing over network connection is quite good, job gets done in roughly 10 seconds. @TVE has done great work on developing this approach with his esp-link project. Note the Makefile magic that makes all that possible. For devices in production it makes more sense to run in the second firmware update mode, where we have them check for new firmware proactively. That also addresses connectivity issues compared to previous method as the device initiates the process from behind the firewall (no need for fixed IP address, or port forwarding for outside visibility). In terms of security, well, it isn’t the most secure thing. Firmware gets downloaded/uploaded by unsecured HTTP channel and not much validation is performed to ensure the received file is what we think it is. I’m not sure what the overhead in terms of FLASH/RAM would be to enable SSL channel firmware upgrade. 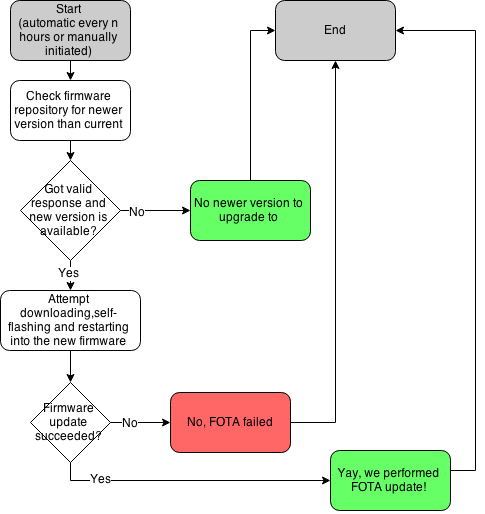 These concerns could be overcome by manually initiating an update (push or pull) and disabling the FOTA interfaces afterwards. What can go wrong will go wrong eventually they say, so things must be handled properly. Interrupted download/upload, failed validation result in falling back to the previous firmware. The goal is obvious – to prevent a bricked device. While there is petty good protection against these, there is no protection against uploading buggy new firmware that bricks the device. Doing some testing, then some more testing and again testing before releasing new firmware should reduce the risk for that happening, and rolling it out in small portions also helps identifying a problem before many devices are affected. 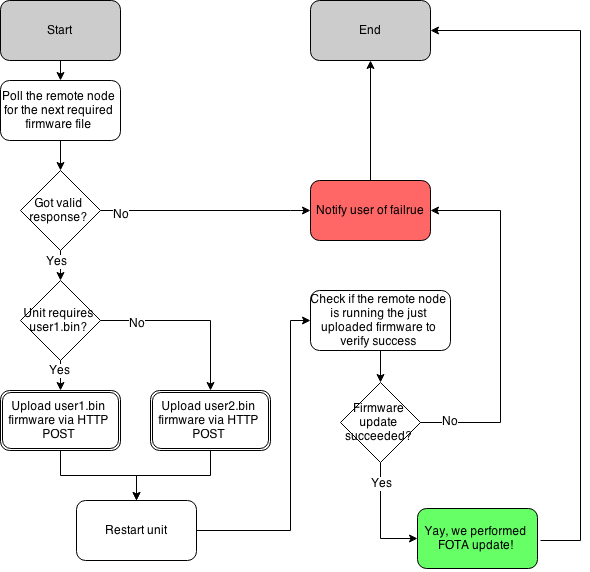 I’m convinced the FOTA feature is a “must have” for any serious IoT project. I’m developing a FOTA capable (FOTA+ESPHTTPD+MQTT+SSL+FLASH CONFIG) platform that I will use for my future ESP8266 related projects. …I think you should change the 512Mb to 512kB all over the text?! I’m also not thrilled about the security situation. If you have a trusted encrypted network, like your own home network, it’s not all that bad. I’ll see what happens when I turn on SSL… Fortunately there are newer devices coming with 4x the flash space, which will alleviate this issue. “FOTA+ESPHTTPD+MQTT+SSL+FLASH CONFIG” I would love to see this framework! How does ‘handleUpgrade’ get called? You get to call it when needed. My other part of the code (not published here) checks firmware version on server and if greater than currently running calls it. I am getting this as error continuously. I say try to pinpoint the exact line you get the exception at and focus the effort to fix there. I do that by placing printfs “Got here..” around the code and seeing if it ever gets reached. You lnow much of wifi API is in the user binary (flash) ? I was wondering if we could just jump to RAM dynamically, with a small RAM firmware with wifi support (basic support). That way we could just erase whole of SPI flash and program it. Of course, any connection issue would cause system to never reboot properly. Alternative is to hook an additional SPI flash to my design (which should be simple), and use it for storing the temporary fw (and then use RAM-only code to flash the main flash). Would also be nice cause I can use it for other needed storage, and those chips are really cheap (20 cents or so for 8mbit). My design boosts an ESP8266 (ESP07) module and a small CPLD (Xilinx) in order to drive RGB panels through SPI port. It’s working well, seral programming (and console) both work, but I really could use OTA upgrades. I’m planning to have the design on sale by end of this year, but OTA needs to be in place by then. FOTA isn’t entirely reliable, in fact I am seeing 70-80% success and have to re-run for the failed attempts. Network glitches/hiccups cause timing it out, so RAM based updates are in my opinion out of the question. I don’t see a problem splitting relatively large flash chips in two, that still leaves you with tons of space to use. 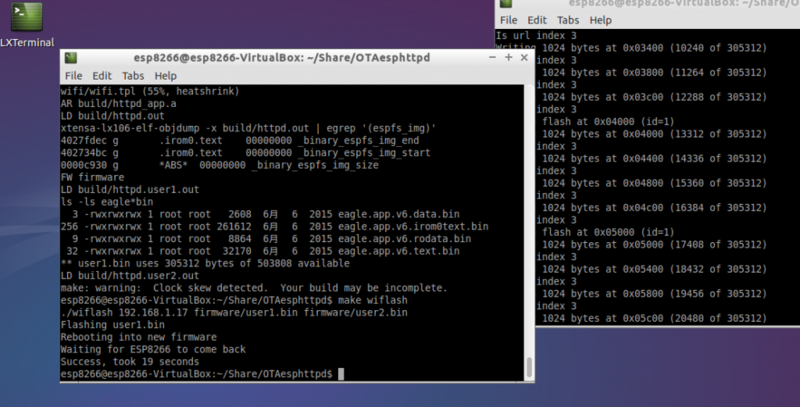 I got problem with FOTA, I use ESP07 1Mb with SDK 1.2.0 (I also try 1.1.2 and 1.3.0 and got the same result). I use your code with a minor modification about the file URL (I’m check Apache log and sure the board uses right url – “GET /upgrade/user1.1024.new.2.bin HTTP/1.1” 200 304240 “-” “-“). Do you have any idea about this problem??? Aren’t you running bin1 and flashing bin1 at the same time?